Hoffmeyer Rd. 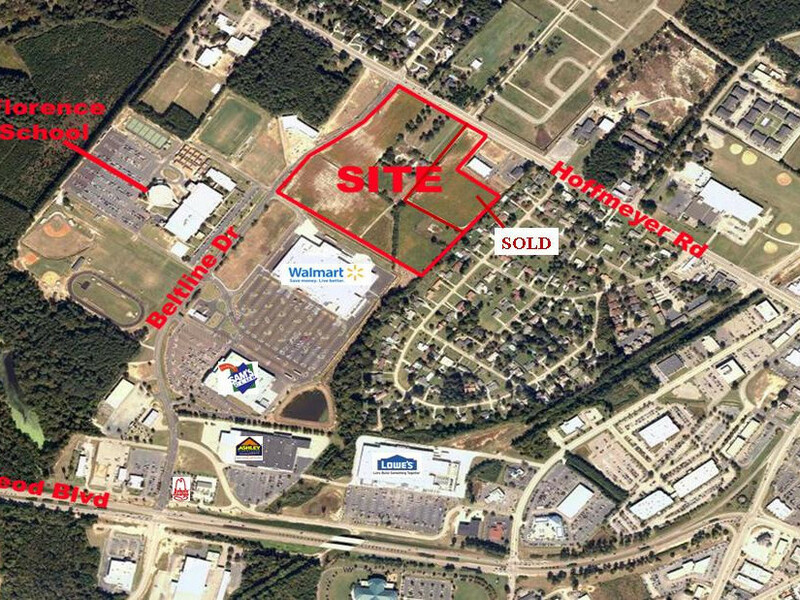 & Beltline Dr.
For Sale All Locations, South Carolina, Florence Hoffmeyer Rd. & Beltline Dr. Available is approximately 25.17 acres primed for development with the new resurgence of Florence’s commercial market. Situated just north of David McLeod Blvd, near the intersection of Interstates 95 & 20, this site is in one of Florence’s fastest growing commercial markets and also adjacent to middle & upper income residential neighborhoods. Hoffmeyer Rd is a heavily traveled 4-lane commuter and commercial corridor leading east to 5-Points. Both David McLeod Blvd and 5-Points are home to national and regional retailers, food & beverage, and professional services. Neighbors include Walmart, Sam’s Club, Lowe’s, Ashley Furniture, Hobby Lobby, Magnolia Mall, Belk’s, Sears, JC Penney, Texas Roadhouse, Percy & Willies, Olive Garden, West Florence High School, numerous hotels, the Florence Civic Center, and more. 10” city water is located on the west side of Beltline Drive and beneath Hoffmeyer Road. 8” city sewer is on the site’s side of Beltline Dr and along Hoffmeyer Rd, with a manhole at SE corner of Beltline & Hoffmeyer. The site is ideal for a grocery or big box anchored neighborhood center.